Use my Christmas table runner pattern to create a table runner that finishes at approximately 14-1/4" x 42-1/2" before borders are added. Increase the runner's size by adding custom borders. This table runner is sewn in traditional Christmas colors, but it's easy to change the theme by simply choosing different fabrics. The table runner pattern was originally written as somewhat of a mystery quilt, with instructions released over a few weeks. All of the instructions are visible now, so peek ahead to see the finished project. 1-3/4 yards - less if you don't mind piecing for length. We'll cut it later. 3/4 yard. We'll cut it later. Use these quick-piecing instructions to make a total of forty-eight half square triangle units by pairing each 3-3/8" light square with a dark, small print square of the same size. After assembly, each triangle-square should measure 3" x 3". Arrange four of the half square triangle units as shown in the photo above, with two units each in two rows. Sew components of each row together and press seams between rows in opposite directions. Repeat to make a total of 12 identical 4-piece units from the remaining triangle-squares. Gather the twelve pieced patchwork units and the two 5-1/2" squares cut from a contrasting fabric. Sew two patchwork units side by side to make a row, top illustration in the photo above. Repeat to make a total of four identical rows. Sew a 5-1/2" square between two remaining four-patch units as illustrated in the bottom portion of the photo. Pay close attention to the arrangement of the light and dark fabrics—units are positioned differently on each side of the square. Find the two triangles cut by dividing a 10-7/8" square in half once diagonally. Sew a line of stitches about 1/8" from the longest edge of each large triangle. There's no need to start at a pointed corner—move inward a bit to avoid pushing the tip into the sewing machine feed dogs. The stitches will help stabilize the triangle's stretchy bias edge. That stretchy edge will end up along the table runner's outer perimeter. We would never cut setting triangles in that way if this were a bed quilt in need of as much stability during construction as possible. For a table runner, it's okay, and it helps to conserve fabric. Gather the four triangles cut by dividing the 8-3/8" square in half twice diagonally. Arrange a row unit containing eight half-square triangle units as shown at the top of the photo, with the dark patches in the lower right position. Sew a triangle to the left side of the row unit. Match the top edge of the triangle to the unit as shown. The triangle's sharp point will extend past the bottom of the row. Press the seam allowance towards the triangle. Trim the 'dog ear' tip of the triangle, bottom. Repeat to make a total of four identical units. Each of the table runner's two blocks is assembled in three rows as shown above. Arrange units as shown and then join the rows, butting seam allowances for a perfect fit. Repeat to sew another block. The block layout is obvious now—it is the traditional Winged Square pattern. Find the two triangles you cut by dividing the 10-7/8" square in half once diagonally. Arrange a quilt block on a design wall or table as shown in the top portion of the photograph. Sew a setting triangle to the right upper edge of the quilt block, aligning the squared edge of the triangle with the pointed tip at the block's midpoint. The triangle end that touches the upper edge of the block will extend past the top of the block. Carefully press the seam allowance toward the setting triangle. Trim the little 'dog ear' left at the top seam. Repeat to sew a large triangle to the second quilt block. Flip one of the quilt blocks around, and then sew the diagonal edges between the two block together, butting center seams for a snug fit. Fold each of your four remaining triangles in half, matching their pointed edges. Finger crease and unfold. Sew a corner triangle to each outer diagonal quilt block edge, matching the finger pressed fold to the middle seam of the block. The tips of triangles will extend past block edges. Press the seam allowances towards the corner triangles—Trim dog ears. We chose a narrow border print for the inner border of this table runner and decided not to add more borders. Experiment with your fabrics. Lay your border fabrics next to the quilt top and play with the arrangement, flipping fabrics back and forth and trying different widths until you find a combination that suits you. If you use a border print, be sure to allow a 1/4" seam allowance on each side of the stripe when you cut it out. If a border print isn't quite long enough to extend the entire length of the table runner's longest edge, piece strips together. Cut two segments of a border stripe in the same way. Align the stripes' right sides together, adjusting positions until their motifs match exactly. Use straight pins to keep fabrics from shifting and sew the two together with a 1/4" seam allowance. Trim each border to the required length and sew to the quilt using the linked border directions above—press seam allowances towards the borders. Cut four corner squares with sides that match the height of a border strip. Sew a square to each end of the two short border stripes—press seam allowances towards the squares. Sew the short borders to the ends of the table runner. Add more borders if desired. Sandwich with batting and backing, mark for quilting if necessary. Quilt and bind to finish. 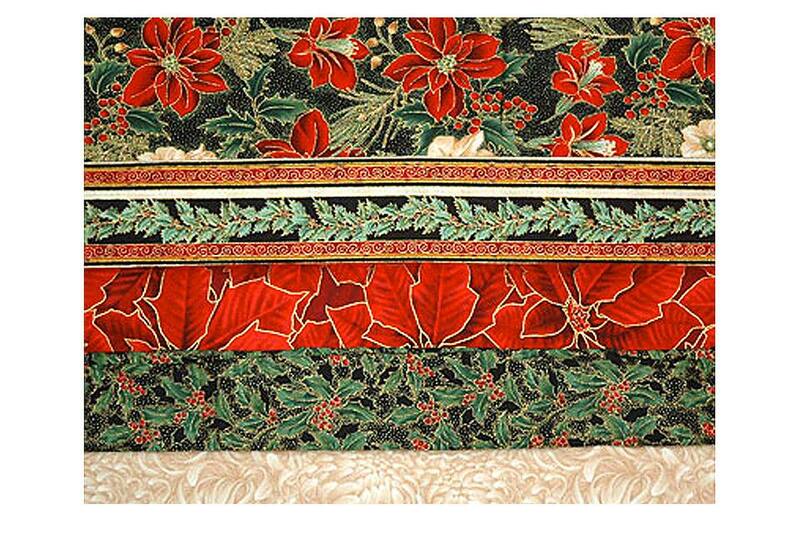 Add or subtract borders in any way you like to make the Christmas table runner suit your needs.